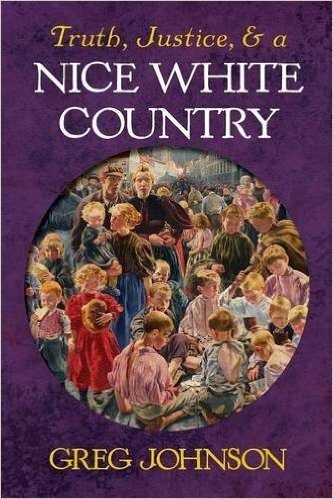 The picture on the cover and the title of Johnson’s latest collection of essays may seem at first glance to offer something of a bromide view of White nationalism: “A nice White country” it reads above a somewhat saccharine image representing healthy White demographics from yesteryear. This sets up a current of wistful yearning, which, given our predicament — heading for minority status in our traditional homelands within decades — is discomforting. But the vision presented by the artful simplicity of the title and cover image is central to Johnson’s whole approach, which I characterize as stating his point as unambiguously as possible, then deploying his considerable powers of reason and evidence to drive it home. This volume brings together 38 essays, all of which appeared on Johnson’s Counter-Currents site between 2011 and 2015, and cover a wide variety of topics. Most were written in response to the events and controversies of the day, so you might expect them to vary considerably in tone and message, but, once again, as with his previous collection “New Right versus Old Right,” the book has a remarkable consistency. The essays are organized thematically instead of chronologically. This grim scenario is the starting point of the book. The rest of the book can then be read as a quest in search of the ultimate solution, namely greater racial awareness and nationalism. One way to view the book is as a voyage in search of this, as Johnson navigates the various issues and controversies of White nationalism, while tacking ahead in the face of challenging headwinds and disruptive squalls. This certainly explains the book’s structure and destination, its hopeful-sounding final section, “Vanguard Strategies” (6 essays). The first Scylla and Charybdis navigated is perhaps the most challenging “Nationalism: Petty and Grandiose” (3 essays) as this opens up one of the fundamental disagreements between White Nationalists, that between two forms of Nationalism. Grandiose Nationalism refers to an internationalized form of White Nationalism that seeks to transcend ethnicity, while Petty Nationalism recognizes the fact that White nationalism is most potent when combined with an ethnic component, and seeks to work with this despite certain negatives. This polarizing debate was brought to the fore in White nationalist and Alt-Right circles in 2014 by two events – the referendum on Scottish Independence and the revolution in Kiev. The third section of the book – “Ukraine & Russia” (4 essays) – therefore represents a continuation on this theme. Johnson rejects the Grandiose version of Nationalism as too abstract and liable to cooption, preferring to embrace Petty Nationalism with qualifications. For this reason he supports Scottish independence – even under the helm of left-wing civic nationalists like the SNP – and the nationalists in the Ukraine despite their alliances of convenience with more globalist elements. As a Scot who has seen how the protracted existence of the UK has pushed Scots to the left as a defence mechanism and protest against the centralization of power in London, I side with Johnson, and believe that before we can have greater White unity, we must first have greater disunity and a proper framework for addressing our very real and potent ethnic divisions. With the debris from Brussels still bobbing on the media tide, the next section in the book “The Muslim Problem” (2 essays) is disappointingly brief, although here too there are valid and useful insights, with Johnson making the case that anti-Islam is a way of venting our need for identity politics in a non-identitarian way, and therefore a mechanism for displacing and diffusing our natural nationalist tendencies. In his essay “The Muslim Problem” (2015), he lays this trick at the door of the one group that Johnson identifies as the chief enemy. One wonders what would happen if the West disengaged from the Middle East. Would we stop defining ourselves by our sense of civilizational distance from “primitive” Islam and the ridiculous repressive tolerance that we occasionally try to impose on it with guns, bombs, drones, and other sinister methods? Would we start to see ourselves in more nationalistic terms? If we could only turn off the distraction of Middle Eastern chaos for a few years, we might find out. As if to mock the West’s attempts to impose its degenerate values where they are not wanted, Johnson follows the brief section on Islam with a larger section on “Sexual Politics” (6 essays). This deals with the gay marriage controversy that was so topical a couple of years ago, but which now seems somewhat passé. In addition to gay marriage, Johnson also takes aim at transsexuals, the Left’s new pet cause. Most nationalists and Alt-Righters agree that gay marriage and transsexual issues are relative trivialities that affect only a tiny section of the population, and serve mainly as distractions from more important issues. However, attitudes to the manosphere have proven more divisive, with a large controversy earlier this year principally between Johnson and Roosh V of the Return of Kings site. While none of the content from that disagreement makes it into this volume, Johnson’s “Be Yourself” (2012) deals skilfully with some of the same issues. The essay is a commentary on a debate between my Alternative Right colleague Andy Nowicki and Matt Forney, then operating under the pen name of Ferdinand Bardamu. This essay reminds us that Johnson is often adept at charting a subtle and sensible middle course between positions that elicit visceral emotions that lead to pointless divisions. The one issue, however, where he takes a hard-line position is that of malevolent Jewish influence on the West. In “White Genocide” (2015) he pushes the question from “Are they really guilty?” to “Are they really not guilty?” also placing politicians and non-Jewish elites in the dock. The degree to which Jewish influence is responsible for the trajectory of Western decline is a major question for all of us on the Alt-Right, but I think it is fair to say that our decline cannot hinge solely on the malevolence of one group no matter how powerful they are culturally or financially – even with their allies. Much of what is happening also stems from the inherent nature of modernity and general socio-economic patterns – after all, non-Jewed Japan and China also have below-replacement birth rates. Because of the importance of the bigger economic picture, it is encouraging to see a substantial section in the book tackling economic issues, as this is an area where the Alt-Right is often criticized as being weak. “White economics” (8 essays) covers a lot of ground, and although I got the impression that this is not Johnson’s favourite area, there were plenty of good ideas and interesting insights – such as the one about printing expiration dates on money to prevent hoarding and promote economic stimulus. In essence, Nationalism is a human consciousness-raising exercise. If we can achieve that then we’ll have some chance of staving off the blind forces and invisible hands that are conjuring our doom. To do this we will need writers like Johnson who can take readings and chart our course through stormy seas and treacherous shoals with as much precision as the best navigators of our seafaring past. https://www.theoccidentalobserver.net/wp-content/uploads/2018/06/TOO-Full-Logo-660x156-1.png 0 0 Colin Liddell https://www.theoccidentalobserver.net/wp-content/uploads/2018/06/TOO-Full-Logo-660x156-1.png Colin Liddell2016-04-03 06:08:142016-04-04 12:05:59Review of “Truth, Justice, and a Nice White Country"